Photograph taken at Company Week 1981; photographer unknown. 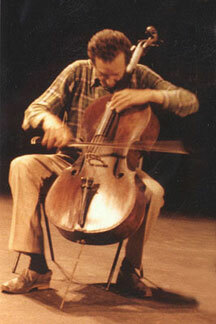 Born in Burlington, Vermont, 23 October 1949; cello. Tristan Honsinger told Kevin Whitehead, 'I grew up in New England, took up cello at age nine in Springfield, Massachusetts... My first teacher was a Dutch Jew. Almost all my teachers were European immigrants. Later I went to the New England Conservatory. It was quite a good school, but I didn't feel very welcome, so I went to Peabody Conservatory in Baltimore from '68 to '69. By then I'd had it, really, with the whole classical music world. I changed teachers so many times, I suppose I was confused by their contradictory advice'. Since the memorable set of concerts in Berlin in 1988, released on the much sought-after FMP box set, Honsinger has been a fairly regular member of Cecil Taylor's groups. At those concerts, Honsinger performed in a trio with Taylor and Evan Parker as well as being a member of the large European Orchestra but since then he has been a member of various Taylor groups, including the now-disbanded European Quartet with Harri Sjöström and Paul Lovens, including an unusual combination that performed at the Total Music Meeting in November 1999: the Cecil Taylor Ensemble with Franky Douglas, Tristan Honsinger and Andrew Cyrille. Currently, Tristan Honsinger is a member of the Tobius Delius 4 Tet, Sean Bergin's various large and small groups, Ig Henneman's string groups and the ICP Orchestra. Buium, G. (2001/2). Tristan Honsinger: the process and the dilemmas. Coda, no. 300/301, (December/January), pp. 26-28. Scott, Richard (1992), Cello fever, The Wire, no. 96, (February), pp. 18-21. Whitehead, Kevin (1998), New Dutch swing, New York: Billboard. ISBN 0-8230-8334-9. Chapter 9, Traveler's tales, has pp. 188-192, devoted to Tristan Honsinger, which has been largely drawn from in creating this page. 1975/76,	Tristan (Duo),	Incus CD 53. Duo with Derek Bailey. Includes re-issue of Incus LP 20 (below). 1976,	Duo,	Incus 20. Duo with Derek Bailey. 1976,	Company 1,	Incus 21. 1976,	Live performances,	FMP SAJ-10. One side solo Honsinger, other solo Altena. 1977,	Company 5,	Incus 28. 1977,	Company 5,	Incus CD41. 1977,	Improvisations	JAPO 60021. Globe Unity. 1977,	In Berlin	FMP SAJ-23. ICP Tentet. 1978,	Laboratorio Della Quercia	Horo HDP 39-40. 1978,	Earmeals, Moers Music 01040. Duo with Günter Christmann. 1980,	Double indemnity,	Y Records 9. Duo with Steve Beresford. 1981,	Lavoro, ?. Sean Bergin. 1981,	Borbeto jam, Cadence CJR 1026. 'Borbetomagus and friends'. 1981,	Imitation of life,	Y Records 13. With Toop, Beresford, Kondo. 1983,	What are you talking about?, DIW 456 (CD)/IMA 003/DIW 1119 (LP). Tristan Honsinger/Toshinori Kondo/Peter Kowald/Sabu Toyozumi. 1983,	Sweet Zee, hat Art 2010. Daunik Lazro. 1985,	Picnic,	Data 852. This That and the Other. 1985,	Borbeto jam,	Cadence CJR 1026. Borbetomagus. 1987,	This, that and the other, ITM 971421 LP/0021CD. 1988,	The hearth,	FMP CD 11. Trio with Cecil Taylor and Evan Parker. 1990,	Lingua franca, Nimbus Records. Daniel D'Agaro/Ernst Glerum/Honsinger trio. 1990,	Bospaadje konijnehol II,	ICP 029. ICP Orchestra (one track only). 1991,	Collective improvisation, Bimhuis 003. Quartet of Cor Fuhler/Tristan Honsinger/Maarten Altena/Wim Janssen. 1991,	Live at the BIMhuis, BVHaast CD9202. Sean Bergin and M.O.B. 1993,	Always a pleasure	FMP CD 69. Cecil Taylor Ensemble. 1993,	Conduction #38: In Freud's garden,	New World 80486. Butch Morris. 1994,	Map of moods	FMP CD 76. 1994,	Violin music for supermarkets,	Megaphone 016. Jon Rose. 1995,	Repeat that, repeat, Wig 03. Ig Henneman Tentet. 1996,	Sketches of probability,	AIAI 009. This that and the other. 1996,	AngelicA 1996,	AI 011. Solo and various groups. 1996,	Almeda	FMP CD 126. Cecil Taylor: The Ensemble. 1996,	The light of corona	FMP CD 120. Cecil Taylor: The Ensemble. 1997,	Tarantella,	psi 06.03. Aki Takase piano quintet. 1998,	Indigo, Wig 04. Ig Henneman Tentet. 1993/1998/1999,	Pes, Wig 05. Henneman Strijkkwartet. 1999,	A camel's kiss,	ICP 036. Solo. 1999,	Monitor,	between the lines btl 003. Michael Moore/Cor Fuhler/Tristan Honsinger. 2001,	Air street,	between the lines btl 023. Michael Moore/Cor Fuhler/Tristan Honsinger. 2001,	Adventures in the looking glass,	CIMP 260. Jean Derome/John Heward/Tristan Honsinger. 2002,	Mob mobiel,	DATA:032. Sean Bergin. 2002,	November Music 2002: See the sound, hear the space,	November Music NM 006. One ICP track on compilation CD. 2003,	Live at the Bimhuis,	for T 02. Gravitones & strings. 2005,	Weer is een dag voorbij,	ICP 043. ICP Orchestra. 2005/2006,	Afijn,	Data Images 03/ICP 044. DVD on Misha Mengelberg featuring ICP Orchestra and others. 2005/09,	_A Frames,	dobialabel 002. Compilation CD. 2008,	Friulian sketches,	psi 08.07. Alexander Von Schlippenbach. 2008,	Live at the Bimhuis,	ICP 046. ICP Orchestra. 2009,	Luftlucht,	ICP 048. Tobius Delius 4tet. 2009,	ICP Orchestra,	ICP 049. ICP Orchestra. 2009,	!ICP! 50,	ICP 050. ICP Orchestra. 2010,	Stretto,	FMP CD148. Tristan Honsinger/Olaf Rupp. 2012,	Baboon,	Rudi Records RRJ1012. Sartori/Delius/Honsinger. 2013,	Live at the Vortex/Misha enzovoort,	ICP 052CD/053DVD. ICP Orchestra. 2014,	East of the sun,	ICP 51. ICP Orchestra. 2014?,	The house of wasps,	My Best! Records MYRD-82. Just Off. 2015,	Restless in pieces,	ICP 054. ICP Orchestra.